Temprite engineers work with customers and specialists in the CO2 field to develop innovative products that increase the efficiency and system life of leading-edge refrigeration technology. Let Temprite know what you need for your CO2 system. We can produce liquid receivers and other high-pressure components for CO2 applications to meet customer requirements. High Efficiency: most efficient oil-refrigerant filtering and separation technology with a 98.5%+ separation efficiency rating across the widest range of mass flows. Energy-Saving: minimizes the amount of oil in the evaporator, improving heat transfer efficiency. Cost-Saving: ensures shorter compressor run times. *Contact Temprite for individual product certification details. *Model 131 is hermetic and the filter is not accessible for changing. Individually Adjustable Mounting Feet: allow for variable field leveling and adjustment. Internal Oil Level Monitoring: the integral oil reservoir and sensor port allows monitoring of the internal oil level and the controlled return of the cleaned oil to the compressor crank case for continued lubrication of the moving parts. CO2 is inexpensive and environmentally friendly but using CO2 as a refrigerant presents several challenges. Most traditional refrigerants have a maximum pressure rating of around 31.0 to 34.5 bar (450 to 500 PSI), but in CO2 subcritical applications, pressures could exceed 131 bar (1900 PSI). 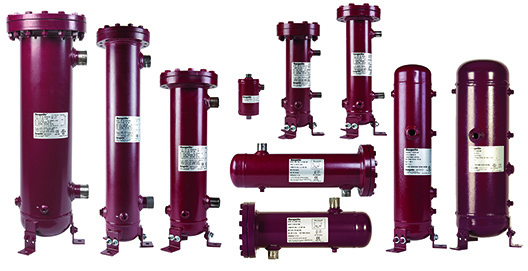 130 Series coalescent oil separators create an efficient, cost-effective reliable system that accommodates typical system operating pressures. *The 920 & 920R Series of products are suitable for subcritical applications up to 44.8 bar (650 PSI). High-pressure systems such as CO2 tend to have system-connecting lines made from pipe instead of tubing. Pipe is inherently dirtier than tube and requires welding versus the cleaner brazing process associated with tubing. This means more dirt in the system. Temprite’s Series 130 coalescing filtration and separation technology removes dirt from the system better than any other product. Series 130 coalescent oil separators separate and clean oil at a nominal 98.5%+ efficiency level. Series 130 separators can be used efficiently in larger systems. High separation efficiency allows a smaller oil reservoir to be used. CO2 has a much higher density than traditional refrigerants, making it more difficult to separate the oil from the gas and requiring a better separation process. The 130 Series coalescing and separation technology has been proven in laboratory and application testing to be superior to other conventional separators. Read more in the Emerson Report.